Finding Fashion in Appleby-in-Westmorland, Cumbria. 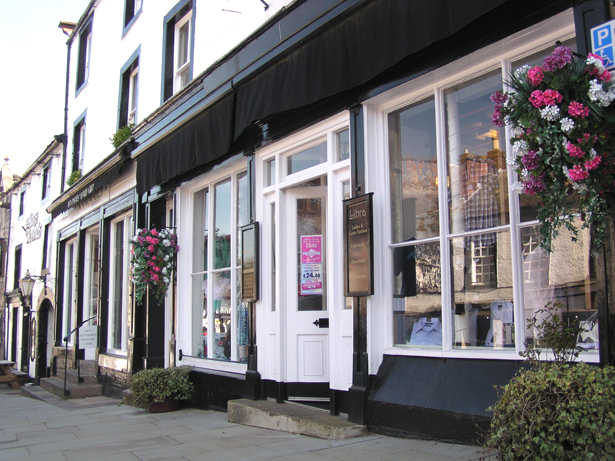 Libra Fashion on Boroughgate, Appleby. From farm to fashion and country walks to waistlines, Shirley, of Libra Fashions, employs a wealth of knowledge, style and sensitivity when she selects the clothes that dress the rails and mannequins of her boutique. One would be underestimating this little gem nestling amongst the 18th century architecture of Boroughgate if you were to pass it by thinking it wouldn't have something for you. question worth spending time getting to know, not least for opportunity to engage in conversation with Shirley. Shirley grew up a farmer's daughter, so she understands the roots of the countryside and the people that live there. Unlike most farmers' daughters Shirley is just at ease watching size zero models strut their stuff down Europe's catwalks as she is watching lambs bounce across Cumbria's countryside in spring. It's likely when you walk into Shirley's boutique she'll say, "Hello" and ask you how is your day. You're likely to answer something like, "Oh busy, you know", and that's why you've walked into the right place. Shirley understands a busy lifestyle requires clothes that are easy to wear from day into evening and by adding a touch here or a splash there of dress, jacket, top or scarf, you're going to look good and feel great.